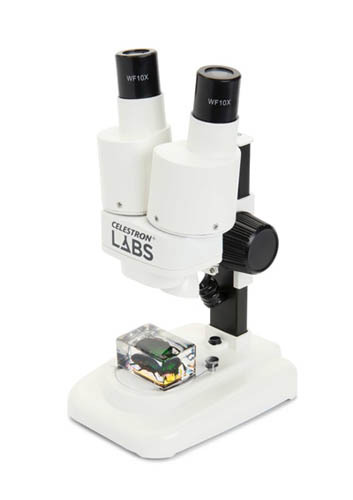 The Celestron 44207 is the perfect introductory stereo microscope offered at an economical price. With its 20x power, it’s well suited for viewing details on 3D objects such as leaves, insects and many other objects. The upper LED illuminator provides detailed viewing and with the removable stage plate there is an option for bottom lighting (user supplied). You’ll enjoy exciting discoveries right out of the box with the two included insect specimens. The S20 Stereo Microscope is light and easy to carry in the field making it well suited for hobbyists and students. The Celestron 44207 has many exciting features for users of all types. You can extend the lifetime of your Celestron 44207 with the purchase of a FactoryOutletStore Factory Protection Plan. See the Celestron 44207 gallery images above for more product views. The Celestron 44207 is sold as a Brand New Unopened Item.